I recently "traded work" with a gal. 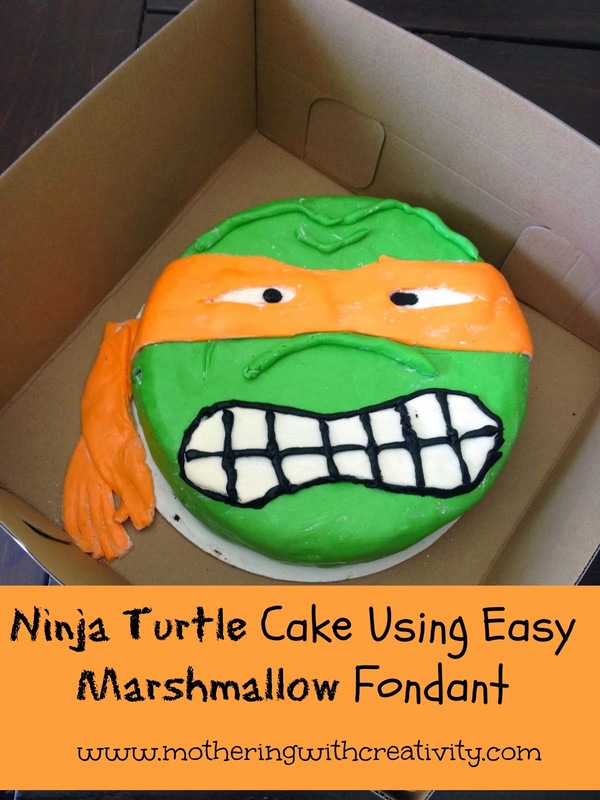 She made some stellar artwork for my ebook, and in exchange, I made her a ninja turtle cake for her boyfriends birthday (further confirming my notion that boys never fully grow up...). This was a really fun cake to make. I only wish I could've eaten it, too! I used this yellow cake recipe. *Mix in powdered sugar slowly. *Slowly mix in the milk. This easy marshmallow fondant is SO easy to make and work with. I've used it a number of times and always love the results. It will be white. Split it up into portions for the different colors. For this ninja turtle cake, I rolled most of it into green, a small portion orange, and a small portion white. I used Wilton's gel colors. I stuck some white for the eyes, cut slits out of the orange, and placed the orange mask over his eyes. I then used black squeeze frosting to dot the eyes. Then the mouth...I rolled out the white, and used a knife to cut it into shape. Then I used the black frosting to make the teeth. When working with this fondant, powdered sugar is your friend. It will prevent sticking. BUT, you'll end up with the white stuff all over your cake. To get it off, get your hands a TINY bit wet and rub it over the powdered sugar spots. This will clean up your cake. You can also use a slightly wet rag, but I like the control I have with my own fingers. Also, when layering fondant over fondant, if you rub your moist fingers between the layers, they will stick better. And again, the key here is only "sightly damp" fingers (I wet my hands and then dab them on a dry towel first). From start to finish, this cake took me about 3 hours. I LOVE how it turned out!